Individual modules of the DMU-Toolkit are part of any software solution from the standard entry-level solution for a system with ten users to custom built solutions for automotive companies with several thousand users; for engineers and designers or for installation and service areas; sometimes coupled with a CAD or PDM system, sometimes as a stand-alone solution. The following table shows the modules from the Teraport DMU-Toolkit. The blocks are grouped by function modules (dark blue), interface modules (grey) and graphical user interfaces for interaction (light blue). The user decides whether he wants a preconfigured solution or prefers a customised software process. 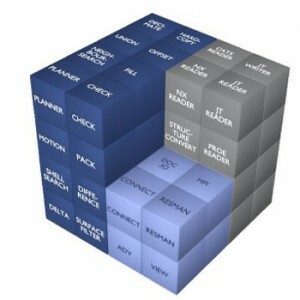 A multitude of available data interfaces allow the use of files of various product development environments (CATIA, Creo, NX, SolidWorks, …). MODULAR and FLEXIBLE The Teraport DMU-Toolkit is highly flexible modular software. The software can be used individually or in combination at various points in the engineering process. This means tailor-made solutions for specific customer requirements. NEUTRAL and OPEN The high-end solutions are characterised by their neutrality. In general, the individual modules process neutrally all common proprietary data formats in the industry. To this is added the openness to/for various engineering systems (e.g. PDM, CAD or VR). POWERFUL and AUTOMATED Powerful, stable and methodically innovative algorithms ensure the highest performance, even on standard hardware. All modules can be operated in batch and thereby facilitate the processing of 3D mass data. Thus, virtually all DMU processes can be fully automated.